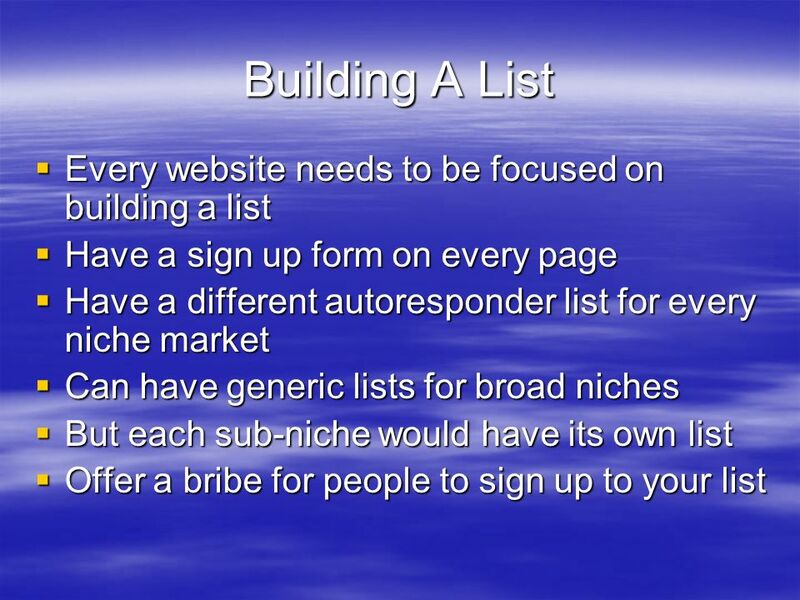 Building A List Every website needs to be focused on building a list Every website needs to be focused on building a list Have a sign up form on every. 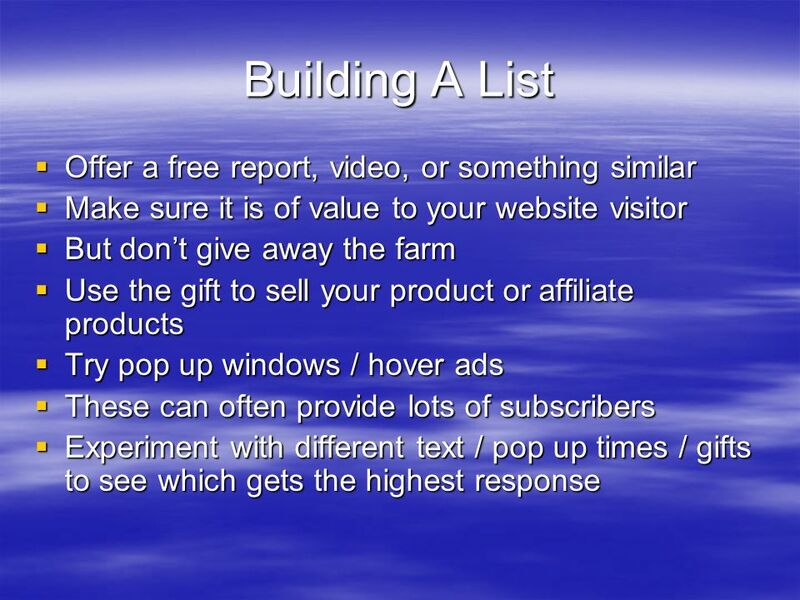 Download ppt "Building A List Every website needs to be focused on building a list Every website needs to be focused on building a list Have a sign up form on every." Conversion pages Get Set Up. The first impression ad is designed to peak your targets interest Your “cheese” is something that would benefit them so they. Conversion Pages Get Them to Take Action. The 1 st rule to understand – 93% of website visitors will NOT take action on the first visit This holds true. Marketing: Business and Legal Strategies Kate Smith, WOOD HERRON & EVANS LLP. Presented By Eyyup Gur Volkan Dogan. Company Background It was established to do toy business in shopping malls locally in Houston. It has been in market. Integrating Online Tools, Networks and Advertising to Get More Leads, Close More Prospects & Make More Profits Ajit Nawalkha Agora Web Consulting. 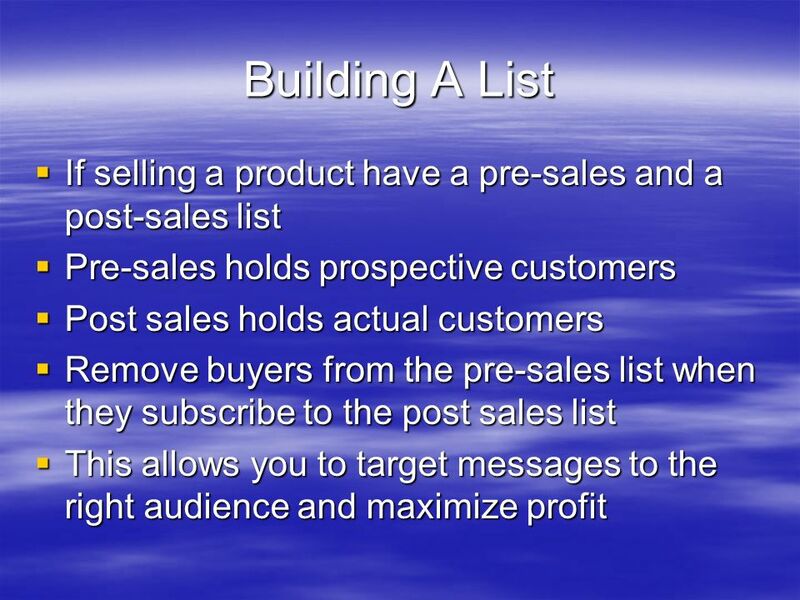 Lack of Leads Lack of Money Lack of Marketing Training Lack of Duplication. MARKETING. Advertising media are channels of communication Information travels through them to consumer. SOCIAL MARKETING Heather Foster. Who is our Audience? Questions we need to ask ourselves Who are our customers? What do our customers like? Why choose. Online Advertising & PPC (Pay Per click). What is advertising?  Advertising is a (usually paid) placement or promotion of a product in a public arena. About Us LIM is an online consultancy agency, specializing in providing effective & affordable Local Internet Marketing. CB Takeover How To Make Money With Clickbank. What Is Clickbank?  Clickbank is an affiliate network and online payment processor, and it’s free for you.